I was able to meet Roy Clark briefly in my past work in audio production backstage at the Grand Ole Opry. My meeting him was in passing in the long halls backstage at the Opry. That’s just how Roy Clark rolled. In and out just in time. Always in time. I also had a business relationship at one time in the past with Roy’s steel player for fifteen or so years. His steel player’s wife is a successful Gospel artist and they both owned a feed store in Oklahoma. I produced their music web site back in the late 1990s. He related to me the stories of his time in Roy Clark’s band. Roy demanded the best musicians in his band. He would show up to do final rehearsals and then they never saw him ever again until he walked in to take a stage at a show. Roy’s band traveled together by bus. Roy traveled by himself by plane separately from his band. He did not associate with his band other than coming in for final rehearsals to add his final directions and then only on stage. Roy Clark would show up for a gig just in time to do the show – then quickly disappear when the final song finished. That’s how he rolled. He was a very private person. 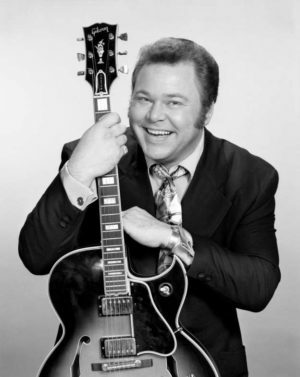 Roy Clark was an excellent virtuoso guitarist as well as a very funny performer. What caused him to be so “hit and run” for his live shows – no one really knows but Roy himself. Rest in peace Roy – at least I felt the breeze from his movements backstage once – which is better than a lot of people who even worked for him.